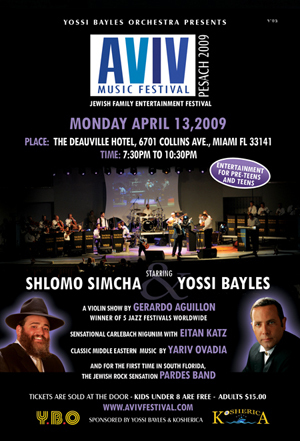 This Year, the Aviv Festival will be held on Chol Hamoed Pesach at the Deauville Hotel, on April 13, 2009 from 7:30 PM to 10:30 PM . Come and enjoy the performance of Shlomo Simcha, Yossi Bayles, Pardes Band, Eitan Katz , Yariv Ovadia and the YBO Orchestra. The festival will be indoor, featuring the most sought after Jewish recording artists in the world of Jewish music as well as great entertainment targeting Pre-Teens and Teens. 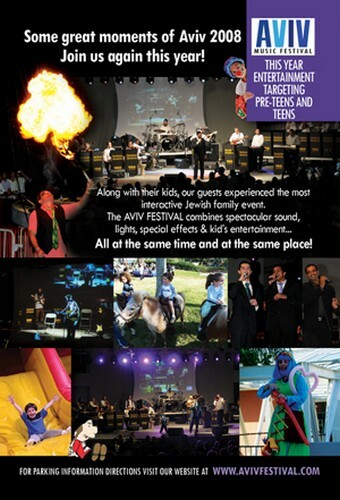 We look forward to seeing you at the most unforgetable event of the year – the AVIV (Spring) Festival! ALL THE FUN FOOD YOU CAN IMAGINE!